Jordan's travel and tourism sector remains robust and with more and more investment pouring in, the kingdom aims to double the contribution the sector to the country's GDP by 2022. 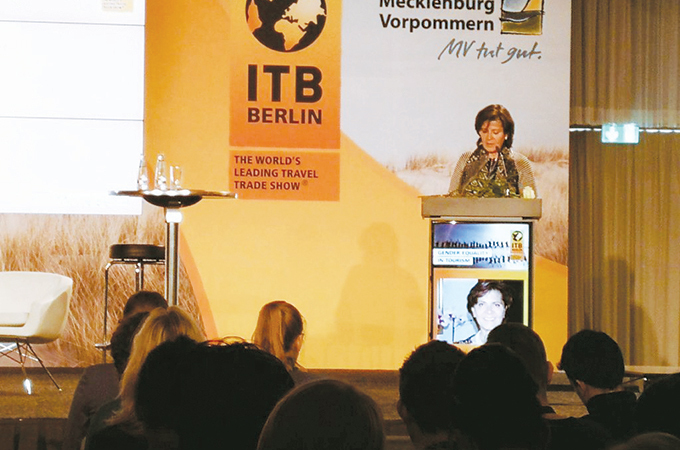 As part of its new tourism strategy, the kingdom will focus on widening the product base so that it can capitalise and leverage on its key resources, said Lina Mazhar Annab, the Minister of Tourism and Antiquities, in an interview with TTN on the sidelines of ITB Berlin expo. "We will identify a potential tourism site and vigorously develop it irrespective of its location as long as there is tourist demand," stated Annab. "Jordan is a wonderfully diverse country offering a range of breathtaking attractions. It is a country that is within a four-hour flight from most of mainland Europe, is renowned for its spectacular scenery, friendly people, excellent infrastructure and awe-inspiring sites, such as Petra, the new 7th world wonder," she said. It has history, culture, ruins and natural wonders jam-packed into a small country with great infrastructure. The people are friendly, welcoming and eager to show guests the best of their country, Annab said. She was speaking after winning the Woman Achiever of the Year award constituted by Pacific Area Travel Writers Association (Patwa) and awarded at the ITB Berlin. Unveiling the kingdom's new tourism strategy, Annab said Jordan has adopted a novel approach identifying promising tourism segments where the kingdom has a competitive strength and also where there is sufficient revenue. "We have a real competitive edge when it comes to adventure tourism, medical and religious tourism, in addition to MICE (Meetings, incentives, conferences and events) segment for which the country already has a full-fledged infrastructure and more investments are pouring into this sector for future projects," stated the minister, citing the King Hussein Bin Talal Convention Centre, a leader in the MICE business in Amman being managed by Hilton. It aims to cater to all segments of the MICE market, from incentive trips involving dune-bashing in Wadi Rum or exploring ancient Petra, to big association meetings hosted at one of the country’s modern conference facilities in Amman or the Dead Sea, said Annab. As part of the new tourism strategy, Jordan has started activating tourism sites that are largely untapped. "Besides this, we are also pumping in funds to develop new tourism projects across the country in line with our plan to boost tourist inflow and also help increase the length of their stay," the minister said. There are many tourist attractions such as Al Maghtas, a Unesco Heritage Site which is one of the most important biblical relics on the east bank of the Jordan River. Also, another tourist attraction is the Dead Sea and the unforgettable Aqaba, Jordan’s gateway to the Red Sea. "Any trip to Jordan wouldn't be complete without a visit to Petra and Wadi Rum," observed Annab. On the country's USP, the Jordanian minister, said: "Uniqueness is our forte. Majority of our historical sites, including ancient ruins, are quite extraordinary. But if you ask me the true USP of Jordan is our people. I have personally witnessed how the tourists who go on a Petra tour come back first praise how wonderful the people are before they talk about the site."